Don't you just love loungewear? It always feels good to come home and change into a comfy and cozy outfit to lounge around the house. Right? I am so excited to share with you a line of sleepwear/loungewear that I absolutely love-- JJ Winks. 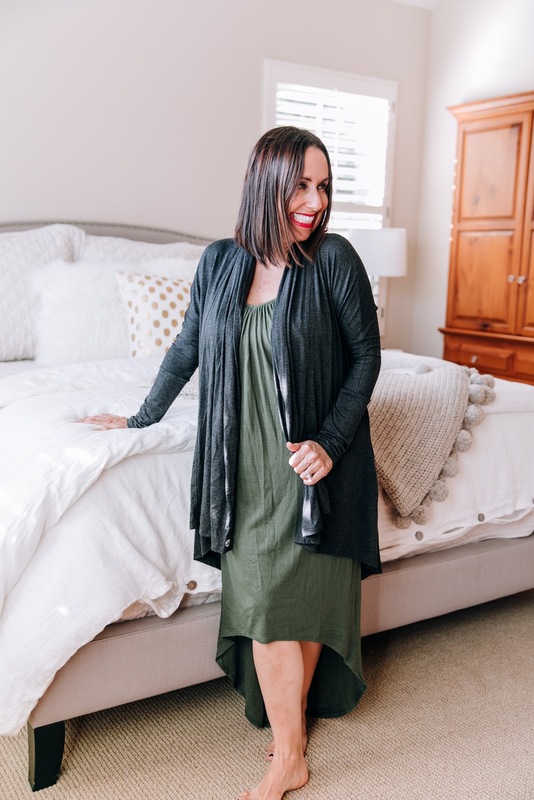 This adorable line was created by two moms that were tired of sacrificing looking good around the house for looking modest around the family. That's why these tops and nightgowns have a Light Hug feature, which enables you to not have to wear a bra in the loungewear so you can look appropriate and sleep comfortably in it all night long. 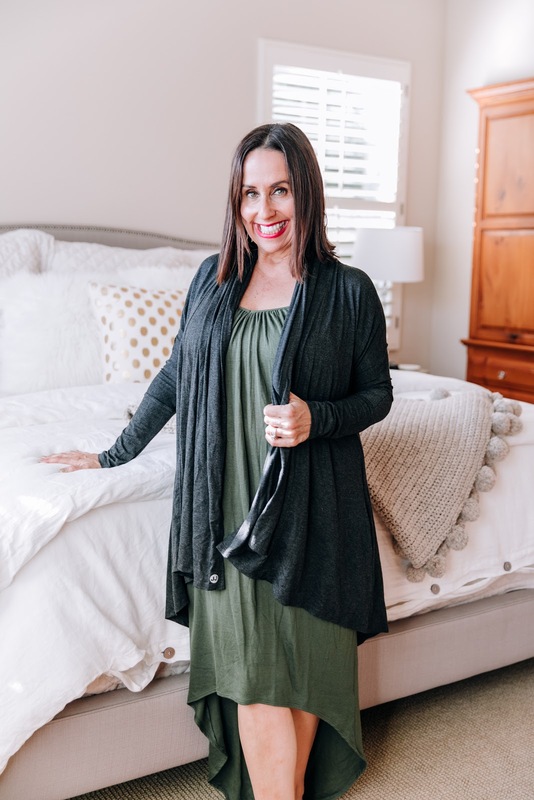 The pieces I am wearing are the Room Service Nightgown in Olive and the Hygge Robe in Charcoal. I absolutely love this combo. I love that I don't have to wear a bra and I feel so supported. I have worn this cute little nightgown as a dress to run errands around town. And when the weather starts cooling down (hopefully soon) I can't wait to wear this cute robe as a jacket over my workout clothes in the morning. So I highly recommend checking out this amazing web site and ordering some comfy pieces of your own. And I am lucky enough to offer my readers a 20% coupon code: Evelyne20. 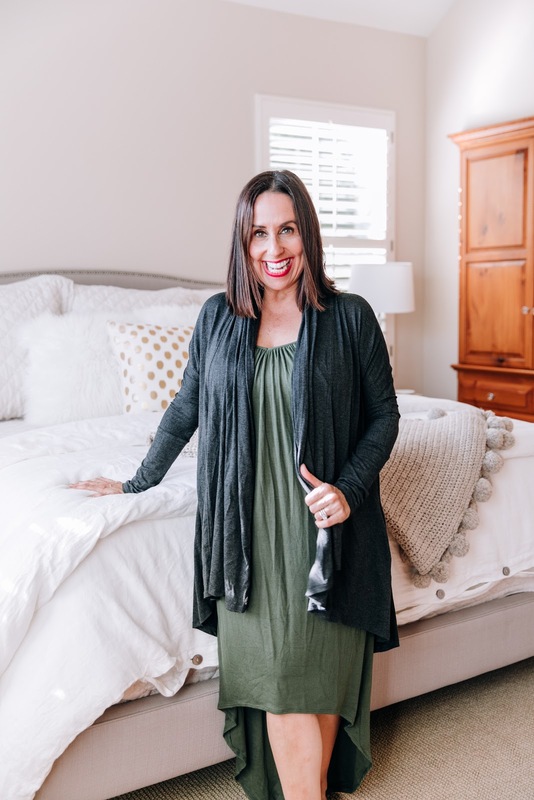 I can't wait to hear how you are styling your loungewear!! Thanks to Kara Nixon for photos. Happy Reading!!!! Oh my gosh, you are just the cutest in this loungewear! Love how comfy it looks on you, and can I say your bedroom is GORG too! !